2018 REGENCY LUXURY VANS XALTA 170E CONVERSION ON THE MERCEDES CHASSIS FOR SALE IN EAST TEXAS. CALL TODAY 855-235-0291 TO SCHEDULE AN APPOINTMENT. Discerning buyers understand that craftsmanship is more then just a word. True iconic masterpieces are not mass-produced with imitation woods and fabrics that render each a commodity. Instead, each is handcrafted, instilling an individual quality that cannot be duplicated. Regency RV and The Wayne Davis Auto Group Company is a select group of highly skilled craftsmen and craftswomen who have formed a 50-year reputation restoring thousands of classic American muscle cars and exotic automobiles for the most discriminating buyers worldwide. So if you’ve taken the time to read this far, then you may be one of the few discerning buyers destined to own a Regency RV. But please understand, no two Regency motor coaches are the same. Each is one of only 250 handcrafted luxury coaches we build each year. Trust your instincts and your senses. We use real American beechwood, hand sanded, stained and polished as we build all our cabinetry in-house. The same care goes into our seating and upholstery. The smell and touch of real leather, never-printed vinyl, makes each Regency unique to each owner. Attention to detail matters. We only use high-quality Corian solid surface countertops, cut and edged in house. We match-paint all exterior vents and cowlings on the roof to match each chassis color. Take a moment to feel and examine our custom paint finish. Yes, it’s the same skilled team that paints and polishes classic cars for The Wayne Davis Auto Group. If you’re an individual who doesn’t follow the pack, then Regency may be for you. If you’re an individual who appreciates and understands true craftsmanship and the value of owning a distinctively unique RV, then Regency is for you. 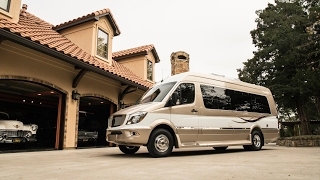 We don’t aspire to be the biggest producer of luxury motorhomes, just the best.